Is The AT For You? Is hiking the Appalachian Trail (AT) something you would never consider doing, not in a million years? Or are you a hiker who has always wanted to do a real leg stretcher like this long trail? You know, something a bit more ambitious than a few nights on a nearby trail? Perhaps you are ready to "go for it", but haven't started your planning yet. And it's going to take a lot of planning to get you safely and comfortably onto the AT. Regardless of which category you fall into, I've gathered some resources for you. I have never made boot prints on this trail. I have no intention of being a thruhiker on an American long trail. I'm content with section hiking the PCT in my Pacific NW backyard. And I prefer back country explorations in alpine terrain. But that doesn't mean I don't want to see you have a grand adventure on it! That's why I gathered together the best of the best for your pondering and planning purposes. Read this to figure out what kind of long distance hiking trail hiker you are. Because your reasons for hiking a long trail are really important to your success and enjoyment. Let's start with general information and get more specific as you proceed down the list. 1. Collections of information sources: Try here at Trailplace. 3. Are you the type of person who needs to see it to believe it? Here's an AT experiential movie: Southbounders. Speaking of books, you can share the story of Grandma Gatewood, the first solo woman through hiker on the AT, with the children in your life. Great motivation for older female hikers, too! 5. Here's a resource which can get you scheming and dreaming! Lots of book ideas here, too. 6. Ready to get down to the nitty gritty? You're going to need food caches. 7. Glean some useful information from this organization, the Appalachian Mountain Club. WhiteBlaze (named for the color of the markers on trees along the Appalachian Trail) is an active forum of trail enthusiasts. It's a great place to "eavesdrop" on all the dirt, both literally and figuratively. They also offer an AT guide book, updated annually, for a modest fee. 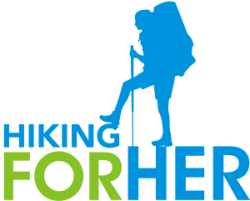 The links above should get you started on working toward your goal of hiking the AT. I'll add more resources as I stumble upon them, or readers send them along to me. Like my review of When Grandma Gatewood Took A Hike. Very inspiring as you get your gear together. Best of luck in your planning! And just in case Western United States long trails pique your interest, here's a movie review about hiking the Pacific Crest Trail (PCT). Enjoy! 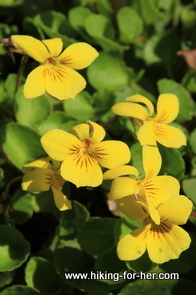 Lovely little violets might grace your campsite on the AT!